Welcome to the David Ray Pine furniture web page! 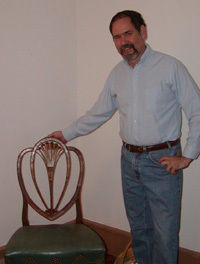 I specialize in building custom-made antique reproduction furniture. In addition, I also do restoration and conservation work on period antique furniture. I worked in three different shops before establishing my own business in 1976. From this background I learned the basic skills involved in making repairs to broken furniture, joinery techniques, and also carving, inlay, and veneer work. All my training has been "on the job", and ranged from furniture restoration, to building one of a kind pieces, to architectural millwork, to limited production. By being exposed to varied shop practices, I've learned that there is often more than one "right" way to solve a given construction problem. The direction my business has taken has been determined partly by my personal inclinations and partly by the needs of my clientele. I enjoy the variety offered by custom work. This week, I'm carving; next week, dovetailing drawers. This client needs chairs; that one, conservation of a corner cabinet. By deliberately not gearing the shop toward any one product or series of operations, it is just as feasible to make the next piece different as to make it the same as the last one. After twenty-some years, though, the pattern wall is getting a little crowded! Over the years, my work has been featured in many different publications, including Money Magazine (Mar 1983), Colonial Homes (Dec 1996), Rural Living (Mar/Apr 1998), and Fine Woodworking, to which I contributed several articles (Issues#59, 64, 77, 80), one of them (Issue#67) featured as the cover story. The "Home" section of the Dec 14, 2000 Washington Post has a photo of a few of the chairs I made for the VA Governor's mansion. As time has passed, the challenges for me have, interestingly, remained fairly constant: to continue to refine my skills, striving to make my furniture ever more accurately reflect period aesthetics and construction methods as revealed by modern scholarship, and to give my client something of lasting value. Copyright (c) 2003 David Ray Pine. All rights reserved.